Mobile BI is hot. 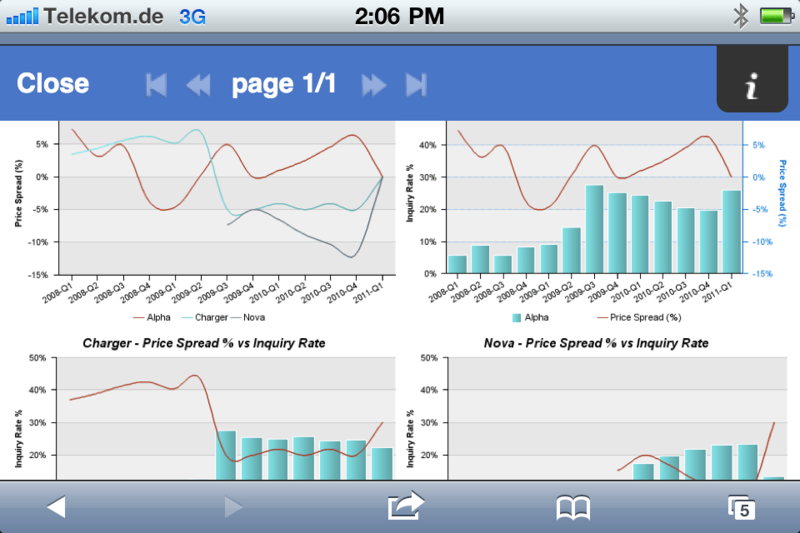 No wonder that the new IBM Cognos iPad app has been getting a lot attention. 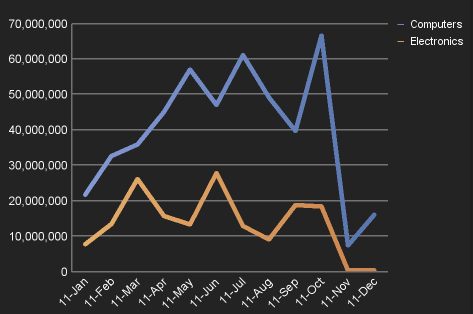 My initial review from a few days ago was quite popular (Thanks for spreading the word!). 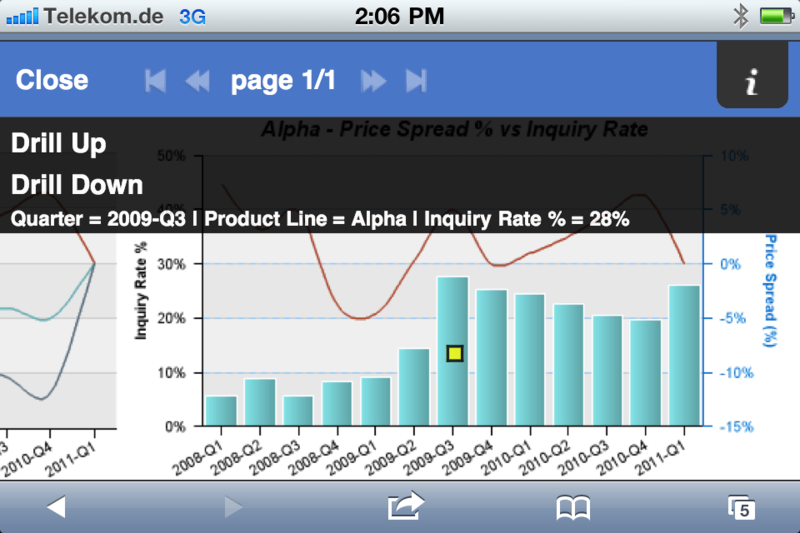 The same is true for the quick report about Cognos 10 on the iPhone. It’s been pretty hectic since then, but I finally had some time to sit down and play with the app a bit more over the past two days. In particular, I wanted to check out the online capabilities. 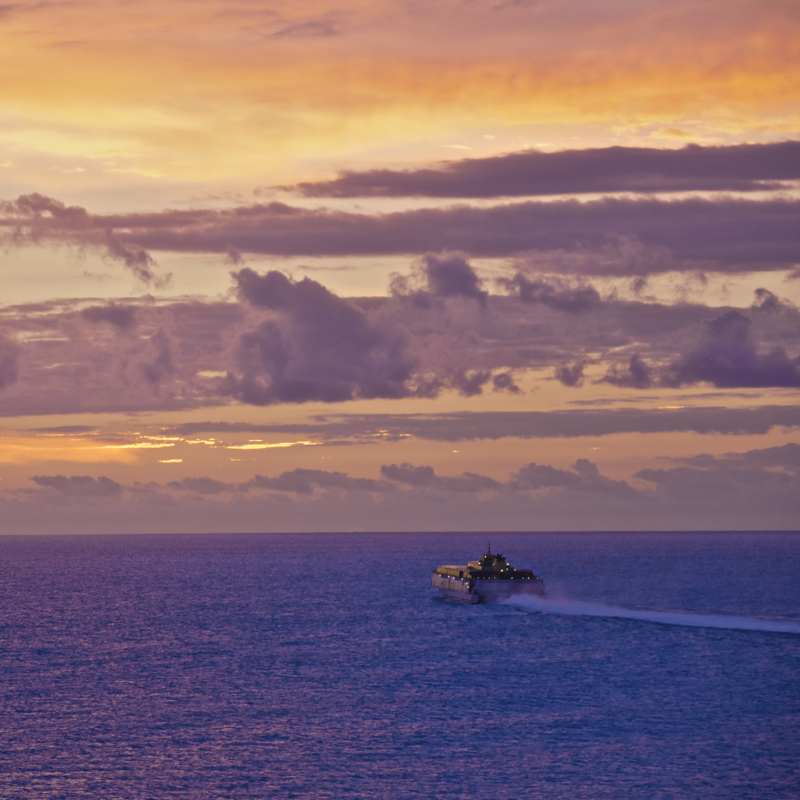 One of the great things about the app is that you can use it offline and online – truly a mobile BI solution. Connecting to my Cognos 10 server was straight forward. I just entered the regular server URL, user ID and password. The app connected without a glitch. All my folders were immediately accessible and I was able to browse through the content using the regular iOS gestures. Instead of browsing you can also perform a search: Click on the magnifying glass, enter a search term and the app will return the relevant objects. The server I was working with is used to run the extremely popular IBM Business Analytics Experience workshop. 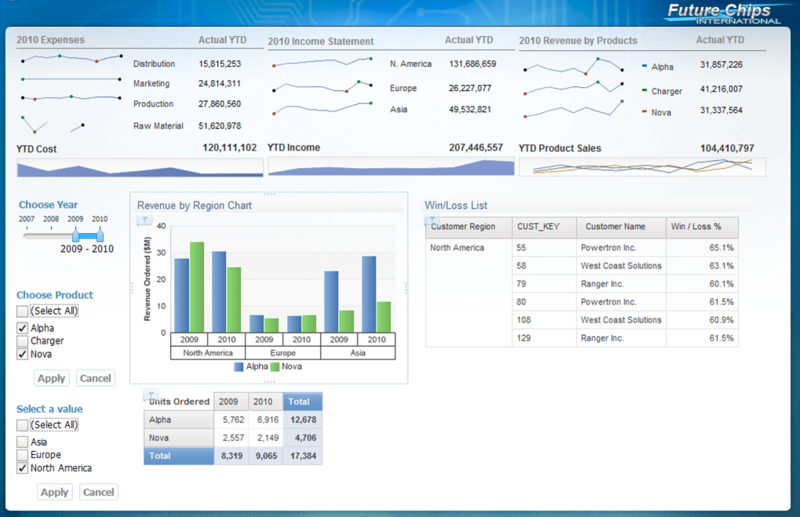 I chose a bunch of reports and dashboards that were developed to run on a regular PC. The iPad app loaded them without hesitation and they looked just as beautiful if not better than on a regular laptop screen. 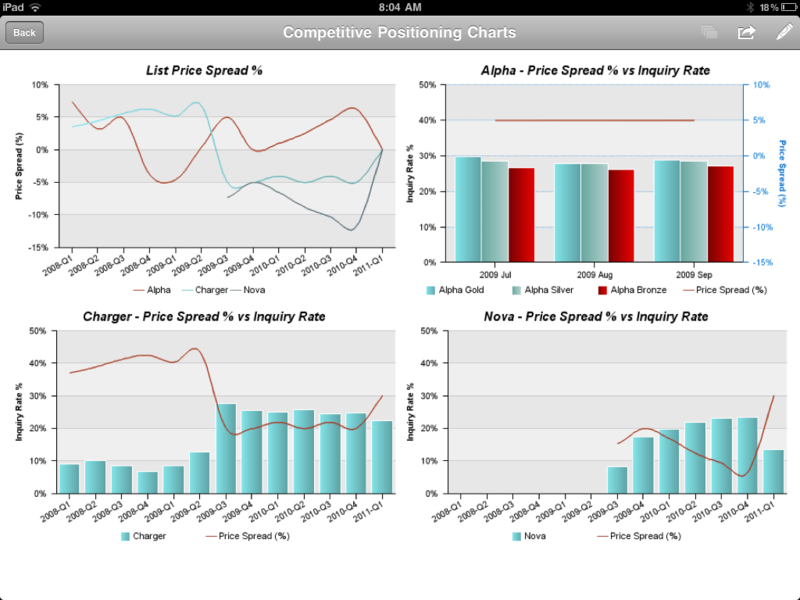 Reviewing the charts and tables is a lot of fun on the iPad. What I enjoyed best though, is the ability to interact: put your finger on a certain data point in a chart and the app will provide the according value in a small bubble. If you want some additional info, just click on the little i icon in the bubble and you will get additional context. Can't touch this? Yes, you sure can. 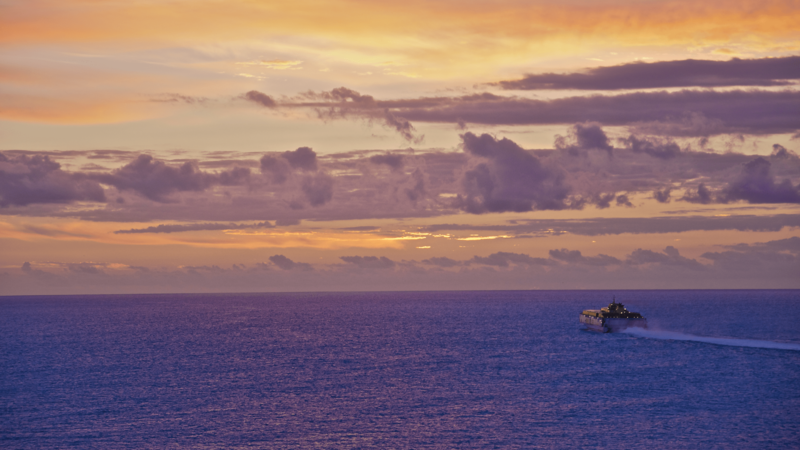 Drilling up and down is just as simple as well. 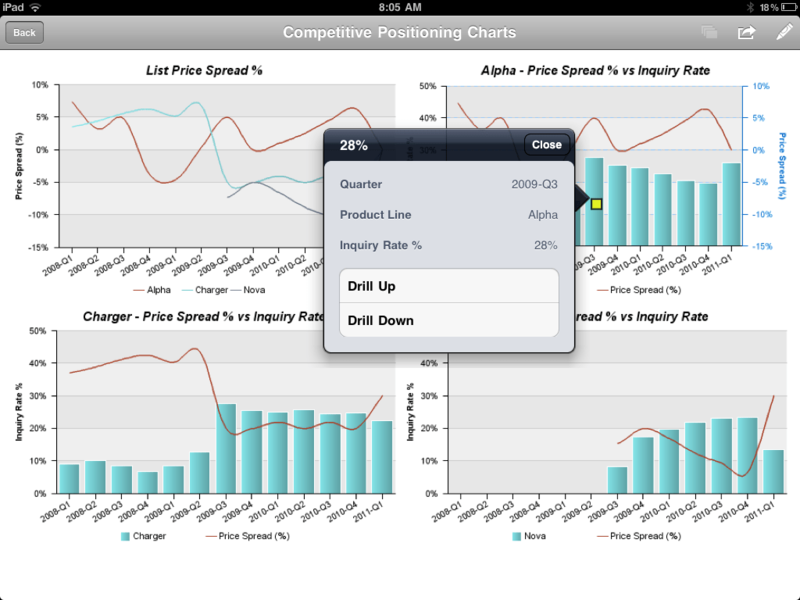 Put your finger on a data point and select drill down/ up. It’s easy and intuitive. Much better than a mouse click. If you have not had a chance to see the app, make sure to download it from the iTunes app store. 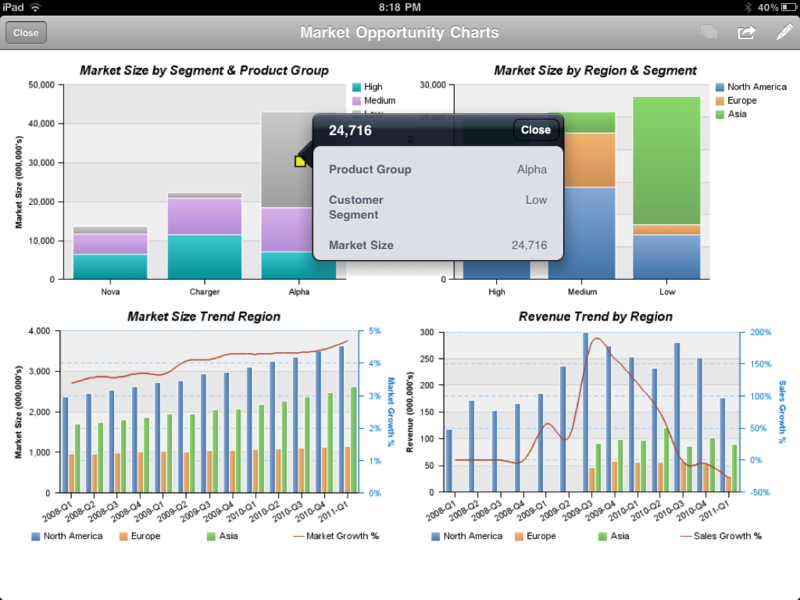 The recent release of the new IBM Cognos Mobile for iPad app has created many excited discussions. I will post a more extensive review in a few days from now. Today I realized that most people have stopped talking about the iPhone. It seems that the iPad is getting all the attention these days. But to be fair, most people probably carry their iPhones with them more often than the iPad. 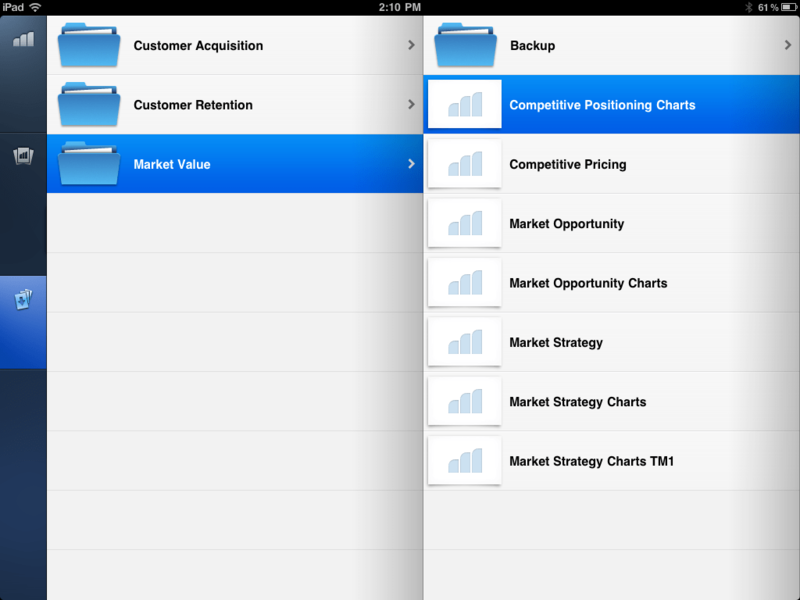 But the good news is that Cognos 10 also runs on the iPhone. 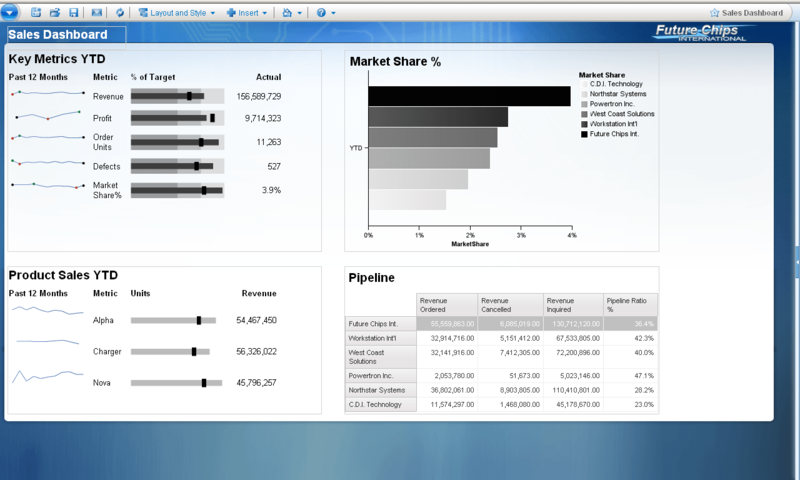 There is no dedicated app, but Cognos 10 runs in Safari. While waiting in the airline lounge to board another flight, I logged onto one of my servers to test the new 10.1.1 functionality. Logging into Cognos 10 is easy. I plugged in the regular server address, entered my user name and password. You can see that I was on the normal 3G network. After logging in, I was able to browse through my content. Everything was there that I expected and navigation follows the regular iPhone gestures: You swipe to scroll through your content and you point to access folders or reporting objects. Of course, it is possible to zoom in and out using gestures. By pointing at data elements, you can bring up a small header that provides additional context (precise values, dimensions etc.). If available, you can also drill up/ down or through. Response time on this dashboard was very decent given the 3G connection. The drill-down took less than 3-5 seconds. 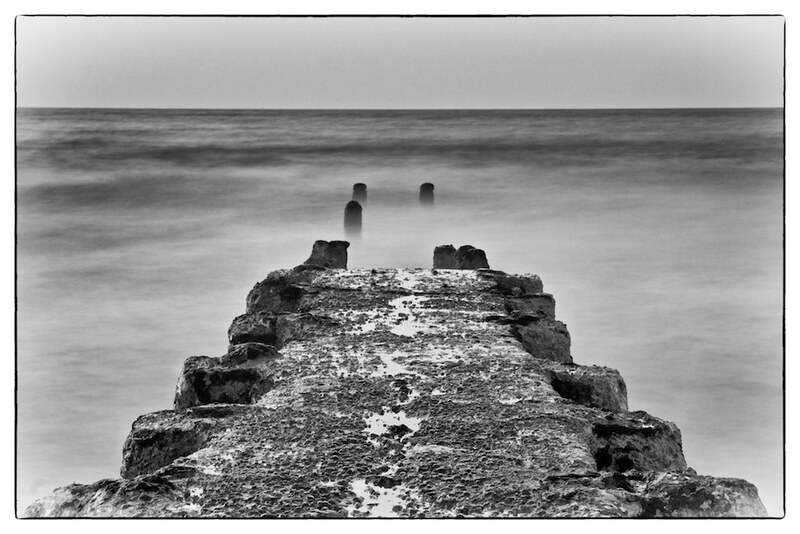 Prompts work as well. It is also possible to build reports with location-awareness prompts that pull the data from the iPhone GPS coordinates. I was not able to test that – maybe in the near future. But the possibilities are awesome if you think about it. 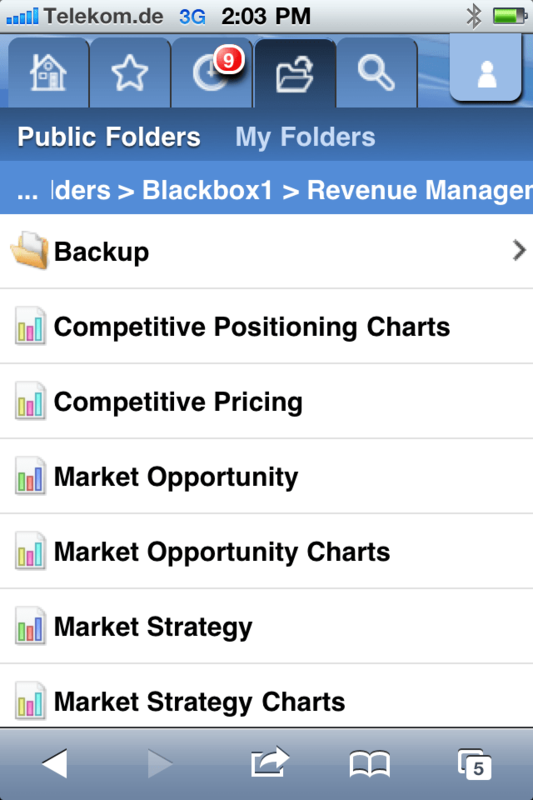 And there are some additional features such as the ability to set favorite reports, select a home screen dashboard etc..
Cognos 10 on the iPhone works pretty well. 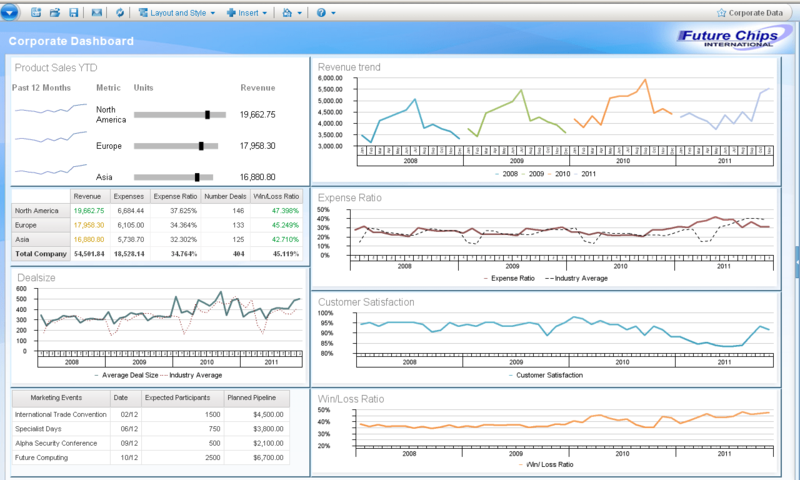 Dashboards and reports do look nice on the small screen. 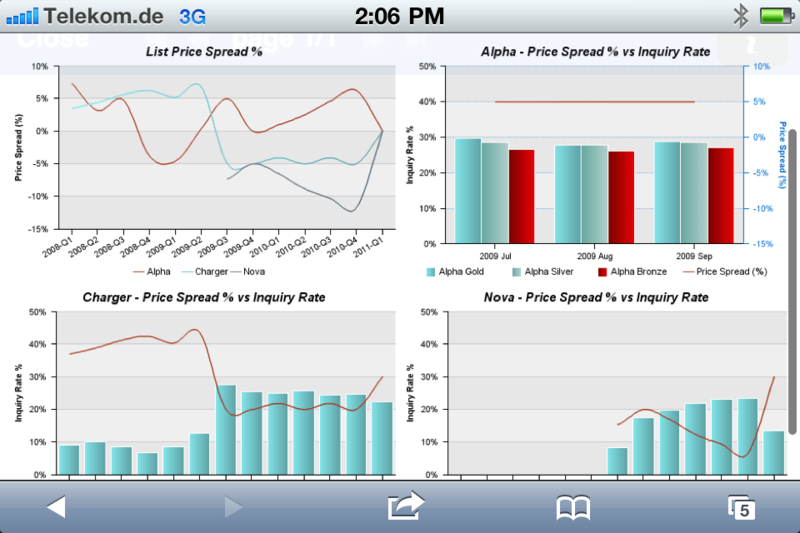 It is easy to review numbers & trends on the go. This is ideal for mobile workers wanting to stay connected with their business no matter where they are. However, the iPad and the laptop are definitely better suited for getting your tough work done. The screen is just not big enough on the iPhone. But that’s no surprise. The iPhone is a phone and not a full-fledged PC after all. 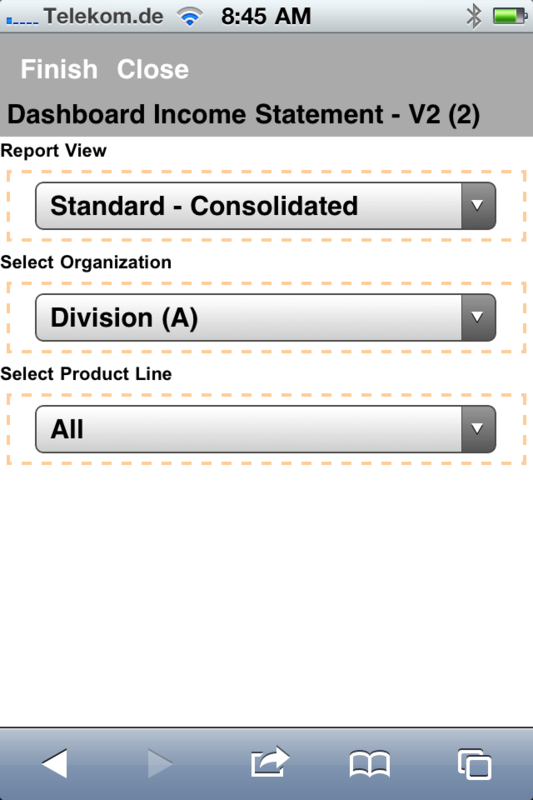 If you want additional information about the updates for IBM Cognos Mobile in version 10.1.1 click here.